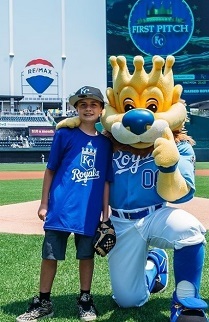 It was a bright, sunny afternoon when the Kansas City Royals completed their sweep of the Minnesota Twins last month. If you’re a Royals fan, you probably remember the game when Drew Butera hit an inside-the-park homer to score 3 runs and win the game 5-3. It was the perfect day for baseball and a highlight of the season. The family – parents, Kevin and Jessica; daughter, Trista; and Gavin – also received a behind-the-scenes tour of the stadium and $1,529 toward college savings. His advice to other families? Start the conversation with your kids now about the importance of higher education and what it takes to fund it. For most, it will be a hybrid approach of personal college savings, student loans and scholarships. Kevin has already talked with Gavin and Trista about how good grades make a difference and the importance of applying for a variety of scholarships to help offset costs when the time comes.